As we see by the lack of Parliamentary Democracy and the ever increasing Parliamentary Dictatorship by the majority party, reforms to Parliament are not about to come through Parliament. It is time for citizens, the voting public to take matters into their own hands via the only option left open to us, a riding association committee controlled “Election Contract”. A contract between the citizens of the riding and the elected candidate to conduct themselves conclusive to open, free, consultative government responsible first and primarily to the constituents who elected him/her. Electoral District Associations, hopefully with the blessings of Elections Canada, will form one association committee to oversee the performance of the Member of Parliament for their Electoral District regardless from which party the MP belongs. Before each election the association committee will ask each candidate to sign a contract with the Riding as to how they shall be expected to perform in Parliament. The contract will give the association the power to remove the MP from representing their riding if contract expectations are not met. In other words the Member of Parliament will be responsible first and foremost to the constituents who elected him/her and not to the political party or the party whip. There is a reasonable possibility that any candidate who is unwilling to sign a constituency contract and commit to Parliamentary reform is not likely to be elected. The role of a Member of Parliament is to represent the people of his/her constituency and not the political party to which he/she belongs or was nominated by even though the party may have paid for his/her election campaign. These constituency contracts are not designed to eliminate political parties but, to limit their influence in Parliament and their control over the proceedings of both the Upper and Lower Houses. It will mean that MPs will have to engage in meaningful deliberations with their constituents and make an effort to gauge the preferences of the constituents before and after debate in the House or casting their vote on each bill that comes before the House. Political parties will still continue to be a main identifier of a candidates politics and will still be needed to aggregate information, pro and con, on any subject or matter before Parliament. There will be the responsibility of maintaining and manning a Constituency Office in each riding perhaps apart from the political party offices. These offices could be financed by the MP allowances or Elections Canada, especially once the idea of Election Contracts becomes established and Parliamentary reforms for good governance are in place. Both Members of Parliament and Elections Canada have need of offices in each constituency regardless. There is no doubt that communicating with the constituents will bring more overall work to each MP and will perhaps slow down the passage of bills in the House but that may be a good thing. Cramming legislation through Parliament will become a practice of the past as will omnibus bills. There should be a practice of keeping the electorate apprised of the goings on in Parliament on a weekly basis apart from what the national news broadcasters deliver. In this day of electronics with email and website forums at almost everyone’s immediate demand, the ability to keep the public informed is basically easy. In those remote regions of Canada where the internet is not as readily available then the old fashioned method of letter correspondence will have to do. The main colaboration will take place between the riding association committee and the MP and it will be the riding association committee’s job to keep the residents in the riding informed as to matters in the House and to keep the MP informed as to the general concensus of the riding, to become the liason between the MP and his/her constituents. The full intention of the Election Contract is to allow the electorate more say in the affairs of Government. Whether or not a person chooses to partake in offering their opinion is entirely up to the individual. The opportunity is given. Just a couple of quotations which quite accurately sum up the state of democracy in Canada. One thing is obviously very clear; the work of reforming Parliament into the democratic, fair debate, honest deliberation, judicial enactments of law for the betterment of all, the House of Governance, Parliament is supposed to be, cannot be left to those whom the people elect. Change can not and will not happen. It is not in their political parties’ interest even though back bench MPs suffer under the yoke of party discipline and a neutered system of parliamentary oversight of the executive. “Although we like to think of ourselves as living in a mature democracy, we live, instead, in something little better than a benign dictatorship,” Stephen Harper wrote in 2006, referring to Chretien’s Liberals. Every Prime Ministerial reign since Trudeau, and many before, has promised the electorate to reform Parliament and make it less partisan and more equitable and impartial, less polarized and factional and more congenial and open. Pierre Trudeau espoused participatory democracy as a means of making Canada a “Just Society”. Introduced procedural reforms to Parliament. Joe Clark introduced the Freedom of Information Act, which would establish the right of access to government records. John Turner attacked patronage appointments and vowed changes to the legal system. His term as PM was too short to accomplish much. Brian Mulroney threatened to abolish the Senate and introduced the ill fated Meech Lake Accord. Brian Mulroney came to power in 1984 and promised major parliamentary reform. Jim McGrath, a veteran Tory MP, headed a committee that recommended fundamental changes: free votes, effective committees and measures to allow private members to create law. Kim Campbell had too short a term as PM to carry through with any meaningful legislation. Has been said it was her frank honesty that ultimately caused her defeat. Jean Chrétien pioneered the Clarity Act and focused on reform of the justice system rather than reform Parliament. 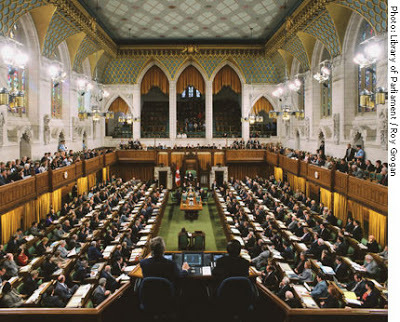 Under Chrétien, answers in the Commons question period were reduced to just 35 seconds, providing great sound bites for TV, but wholly lacking in substance. Paul Martin vowed a “6 point Plan” to reform the house, “restore the individual member of parliament as the link between his or her constituents and government in Canada in a meaningful way”. Stephan Harper vowed to reform Canada’s “archaic” upper house of Parliament, the Senate? As we see by the lack of Parliamentary Democracy and the ever increasing Parliamentary Dictatorship, reforms to Parliament are not coming through Parliament. It is time for citizens, the voting public to take matters into their own hands via the only option left open to us, a riding association committee controlled “Election Contract”. 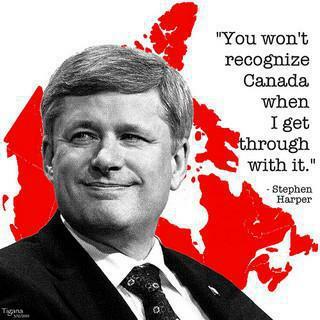 “I couldn’t care less” Stephen Harper’s own words at the Calgary Convention Friday Evening November 1, 2013. Harper and the Tories are making a concerted effort to eliminate what is left of the Employment Insurance that all working Canadians pay into. Bill C-4, Harper’s undemocratic 321-page Omnibus budget bill(one of several), dramatically tipped the balance of collective bargaining in favour of the federal government and effectively took away public service workers’ right to strike and also put the lives of workers in the federal sector at risk by redefining dangerous work. This is the tenth labour law restricting or eliminating labour rights of Canadian workers by the Harper government since they took office in 2006. The arbitration option has been removed for all bargaining units except those where 80 per cent of employees perform work that has been designated “essential” by the employer. Groups that do not meet the 80 per cent threshold are automatically put on the conciliation-strike route. In the few cases where arbitration is allowed, the process will no longer be independent of government. Arbitrators will be limited to consider only two factors: recruitment and retention, and the government’s fiscal circumstances relative to its budgetary policies. That is the road to Fascism. Canada’s 13 provincial and territorial premiers unanimously rejected Prime Minister Stephen Harper’s new job training plan Thursday, arguing that its design flaws could damage their existing efforts to help people find jobs. Harper’s Job Grant program would remove much of existing federal transfers and require the provinces and territories to make up the $600 million shortfall. The business sector, mostly small business, would have to pay an equal amount in the job creation scheme with little guarantee of employee retention. Obviously Harper doesn’t care much about small business either. “I couldn’t care less what they say, we will do the right thing,” Harper said in his address to the party faithful at the Calgary Convention Friday Evening November 1, 2013. Although he was referring to the backlash from the senate scandal, “I couldn’t care less” characterizes Harper on many areas of Canadian lives. Peoples Rights: Regardless of what we consider is fair punishment for the “Rogue Senators”, they still have rights. 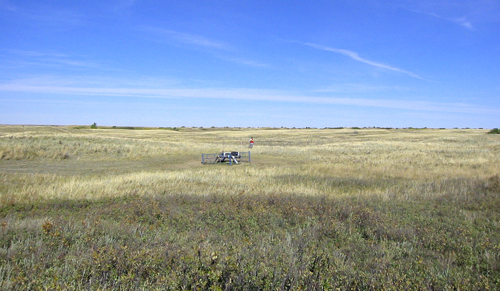 Rights granted them by law under the Canadian Constitution. Before they can be legally pronounced guilty and punished – banished from the Senate without pay – they must be granted their day in court. As to Senators Mike Duffy, Pamala Wallin, Patrick Brazeau, It was Stephen Harper who appointed them. It was Stephen Harper who defended them when their expense accounts were first exposed. It is Stephen Harper who is saying, “I know nothing”. It is called the Harper Salute; Fart and point to the dog. Never admit to being wrong. Harper motto. Stephen Harper is unable to admit responsibility. The fault always lies with someone else. Harper would rather revoke the constitutional right to fair hearing, then brag about it. What is sadder is a room full of Tories cheer. Prime Minister Stephen Harper has written a book on Hockey. 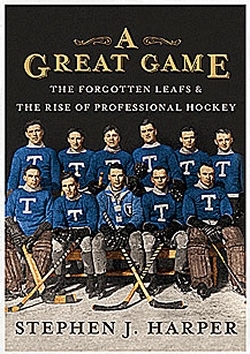 “A Great Game: The The Forgotten Leafs and the Rise of Professional Hockey”. The book goes on sale Nov. 5. You can visit the official website, and view a brief promotional video set to a roaring orchestral score. It is fitting that Stephen Harper write about hockey, the correlation between hockey and his style of government is curious. Hockey is a combatant sport; Harper runs a combatant style politics. Hockey players break a lot of rules; Harper breaks a lot of Parliamentary rules. 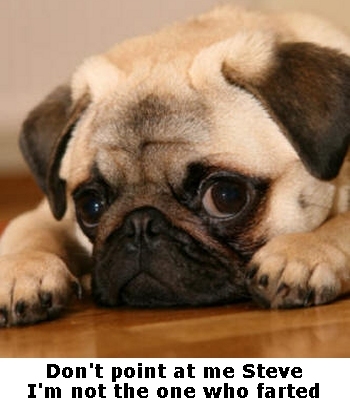 Hockey teams have their enforcers to bully the opposition; Harper enjoys bullying those who oppose him.